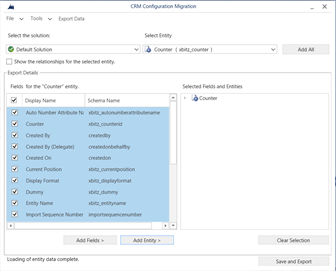 The Configuration Data Migration Tool is a great way of moving records such as custom auto number settings from one organization to another. You can find it in the SDK under SDK\Tools\ConfigurationMigration. When configuring the data schema, you are prompted to select the entities and the attributes that you would like to export and then eventually import. This seems like this is all that is required before hitting 'Save and Export' – but be warned there is one more important step if your data does not have unique display name values. In my example I had two records that had the same name and they already existed in the target organization. Normally, the tool will use the display name attribute to perform a lookup rather than use the primary unique identifier for the record. The result will be that the same record will be updated twice in the target, rather than the two separate records being updated accordingly. You can no click 'Save' and export your data knowing that the primary unique identifier field will be used to match the records between the source and destination. 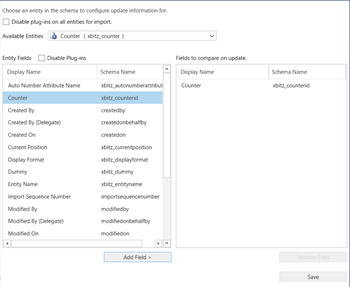 The xml schema file created adds the magic 'updateCompare' attribute to the xml and you are good to go! You can learn more about this very useful tool here - https://technet.microsoft.com/en-us/library/dn647422.aspx Hope this helps!